Home Tags Posts tagged with "supreme court judges"
Supreme Court Judge Ruth Bader Ginsburg was discharged from the hospital following cancer surgery and is recuperating at home, a court spokeswoman has announced. The 85-year-old had surgery to remove two cancerous nodules from her left lung in New York on December 21. The Notorious RBG, who is the most senior justice on the Supreme Court’s liberal wing, has previously had surgery to treat colon cancer and pancreatic cancer. Supreme Court judges serve for life or until they retire. Supporters of Ruth Bader Ginsburg have expressed concern that if anything happened to her, she could be replaced by a conservative justice. According to an earlier statement released by the court, the malignant nodules were initially discovered when Ruth Bader Ginsburg broke three ribs in November. Both were successfully removed at New York’s Memorial Sloan Kettering Cancer Center, and afterwards “there was no evidence of any remaining disease”, it added. No further treatment is planned. Ruth Bader Ginsburg was appointed to the Supreme Court in 1993 by President Bill Clinton. She had previously focused her work on women’s rights and started the first law journal dedicated to the topic. Some of her legal opinions, coupled with her refusal to step down during the Obama era, have seen her gain popularity in some quarters. 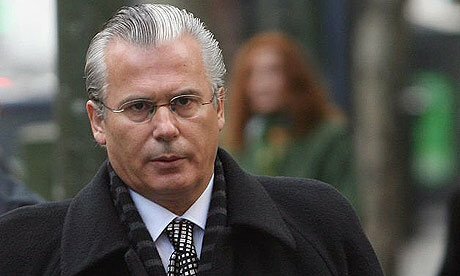 High-profile Spanish judge Baltasar Garzon has been cleared by Supreme Court for violating a 1977 amnesty law with his investigation of Franco-era crimes. Baltasar Garzon had been accused by two right-wing groups of overstepping his powers by trying to prosecute crimes committed between 1936 and 1975. He said crimes against humanity should not be subject to an amnesty. Earlier this month, Baltasar Garzon was suspended from the bench for 11 years after being found guilty of illegal phone tapping. Baltasar Garzon, 56, has vowed to fight that conviction. He faces a third trial, brought by private parties, which involves allegations that he took bribes. The judge is best known worldwide for helping to secure the arrest of the former Chilean leader Augusto Pinochet in London in 1998. But he is a controversial figure who divides opinion in Spain, say observers. Baltasar Garzon’s supporters on the left view him as a champion of human rights and justice, but his detractors believe he is a politically-motivated publicity-seeker. Seven Supreme Court judges cleared Baltasar Garzon on the basis that his investigations into Franco-era crimes were defensible in legal terms. But although it is a significant decision in a significant case, Baltasar Garzon’s suspension from the bar in the earlier case means he will not be able to continue with the investigation. Baltasar Garzon decided in 2008 to investigate the disappearance of tens of thousands of people during the civil war and the subsequent dictatorship of General Francisco Franco, including ordering the excavation of mass graves. The move provoked fierce criticism and anger from those on the right who argued that the point of the 1977 amnesty was to allow Spain to forget the alleged crimes of that era, and move on. Two groups – Clean Hands, and Liberty and Identity – who brought the case against him said they did so because Baltasar Garzon had “reopened wounds which we Spaniards – whatever our political beliefs – had totally recovered from”. But some of Baltasar Garzon’s greatest supporters during his court hearing have been the relatives of those who disappeared, who had pinned their hopes for justice on his investigations.